TSCI's Tamil school follows the "California Tamil Academy's (CTA)" standard and curriculum. This standard was adopted after careful experimenting with our Tamilnadu government standard. The California Tamil Academy's standard seems to suit the education style of our American schools. We started this class with children who are in Kinder Garden and above. However, if you are interested in your kids learning Tamil, and if your child is also showing interest at a younger age, then please contact one of the Tamil administrators for enrollment options. They can be given the lecture of every Tamil class, but home work and/or teaching material will not be given. 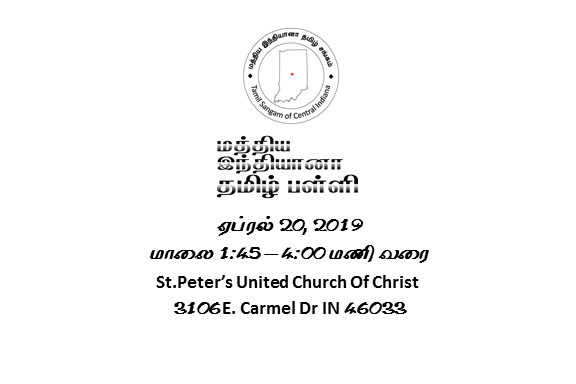 The Tamil class is conducted at the "St.Peters United Church of Christ" every alternative Saturday between 1.45 and 4.00 pm. For more information about the schedule and location please refer to the 'Schedule' section of this site. If you enroll your child in the school, please try to be present in every class. They have so much fun and show interest in their learning. Please see or email the Tamil teachers for enrollment application. Also see the attached form for the Tamil School rules. We follow the California Tamil Academy's curriculum this standard is researched and streamlined to match the learning capability and grades levels aligned to the American school standards. Following this standard will also make sure your child will follow the same curriculum where ever you live in USA. Our goal is to make every child that attends the class be able to read, write and speak the simple Tamil language.